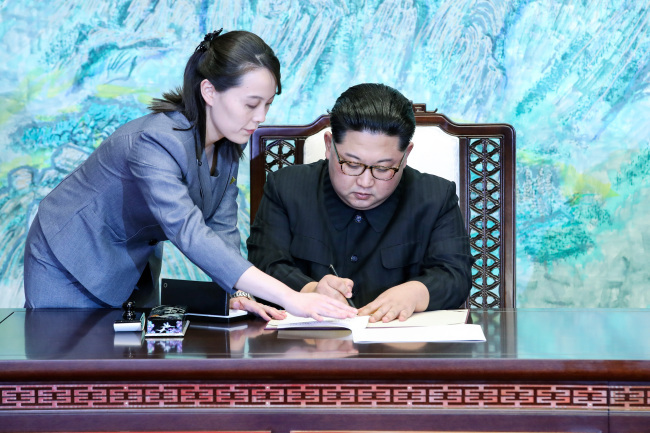 Seoul and Pyongyang will seek multilateral talks aimed at signing a peace treaty, easing military tension and cooperating toward denuclearizing the Korean Peninsula, the two Koreas’ joint Panmunjeom Declaration states. 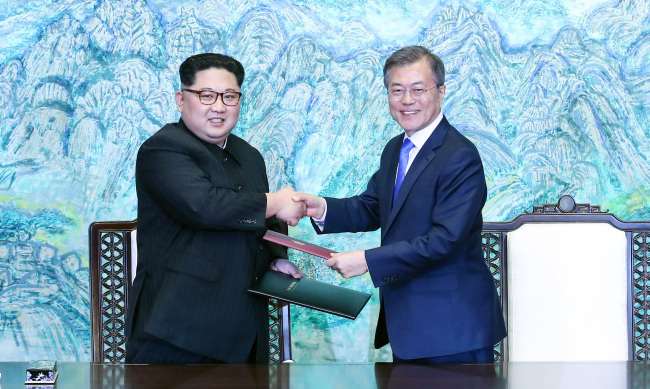 The declaration, drew up after a day of summit talks between President Moon Jae-in and North Korean leader Kim Jong-un, also states that Moon will visit Pyongyang later in the year, and that a reunion of families separated by the Korean War will be arranged. 1. 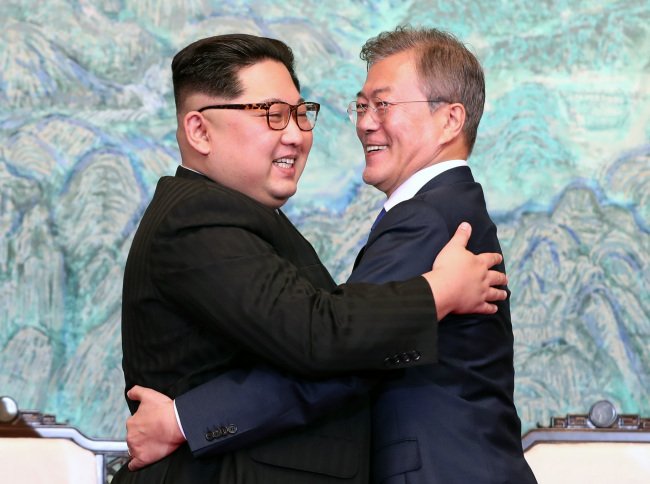 South and North will improve relations to seek shared prosperity and self-reliant reunification. ⓛ The Koreas agreed to seek reunification, and to execute all measures previously agreed to. ② The Koreas will open high-level talks, and negotiations to realize the agreements of the summit meeting. ③ The Koreas will establish a jointly operated communications office in Kaesong. ⑤ The Koreas will open Red Cross talks to seek resolution to humanitarian issues. ⑥ The Koreas will execute projects agreed to in the Oct. 4 Declaration. ① The Koreas will stop all hostilities. 3. 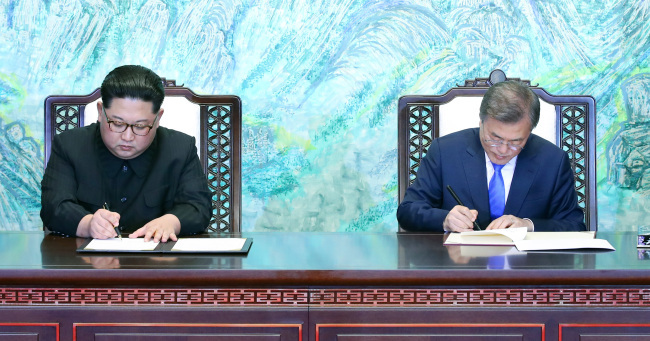 The Koreas will cooperate to establish lasting peace on the Korean Peninsula. ③ The Koreas agreed to seek South-North-US three-way or South-North-US-China talks to bring about a peace treaty. 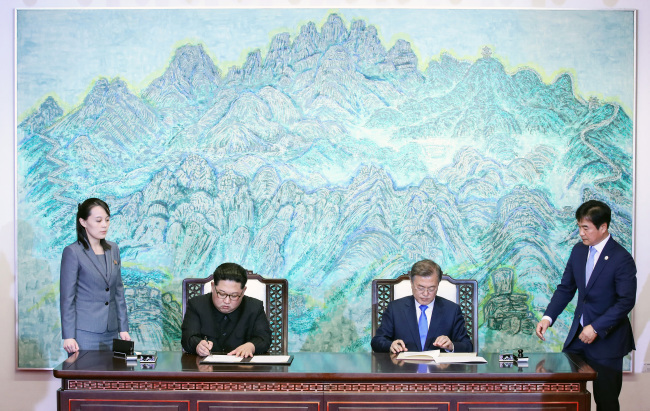 ④ The Koreas reaffirmed the goal of bringing peace through complete denuclearization.